Escape the urban bustle at Portmarnock Beach and Sandymount Strand. Visit Kilmainham Gaol and Trinity College Dublin for their historical value. Next up on the itinerary: wander the streets of Temple Bar, admire the natural beauty at Garden of Remembrance, get a sense of history and politics at General Post Office (GPO), and explore the historical opulence of Dublin Castle. For ratings, other places to visit, and other tourist information, read Dublin travel itinerary creator. Johannesburg, South Africa to Dublin is an approximately 20.5-hour flight. You'll gain 2 hours traveling from Johannesburg to Dublin due to the time zone difference. Plan for colder temperatures traveling from Johannesburg in February, with highs in Dublin at 9°C and lows at 1°C. Wrap up your sightseeing by early afternoon on the 28th (Tue) to allow time for travel to Buncrana. Buncrana is a town in County Donegal, Ireland. You'll get in some beach time at Culdaff Beach and Dunree Bay. Get in touch with nature at Lisfannon Strand and Five Fingers Strand. Go for a jaunt from Buncrana to Falcarragh to see Back Strand Beach about 1:05 hours away. There's more to do: enjoy the sand and surf at Straghill Beach and enjoy the sea views from Buncrana Lighthouse. To find reviews, other places to visit, photos, and other tourist information, refer to the Buncrana itinerary builder. Getting from Dublin to Buncrana by car takes about 3.5 hours. In February in Buncrana, expect temperatures between 9°C during the day and 5°C at night. Finish up your sightseeing early on the 4th (Sat) so you can travel to Carrick. Start off your visit on the 4th (Sat): kick back and relax at Narin Beach, then look for gifts at Triona Design, and then stroll through Maghera Beach and Caves. On the 5th (Sun), you'll have a packed day of sightseeing: take in the dramatic natural features at Slieve League and then enjoy the sand and surf at Silver Strand Beach. For traveler tips, photos, where to stay, and more tourist information, go to the Carrick trip itinerary builder. Traveling by car from Buncrana to Carrick takes 2 hours. Expect a daytime high around 10°C in March, and nighttime lows around 5°C. Finish your sightseeing early on the 6th (Mon) to allow enough time to travel to Dingle. Kick off your visit on the 6th (Mon): pause for some serene contemplation at St.James Church and then enjoy the sand and surf at Inch Beach. 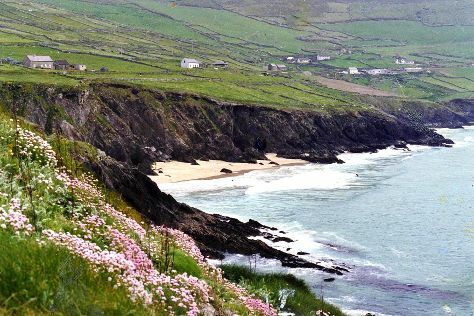 Get ready for a full day of sightseeing on the next day: don't miss a visit to The Dillon Gallery Paintings by Honora O'Neill, step off the mainland to explore Great Blasket Island, then paddle through the water with a kayaking and canoeing tour, and finally enjoy the sand and surf at Coumeenoole Beach. To find ratings, other places to visit, where to stay, and more tourist information, go to the Dingle vacation planner. Traveling by car from Carrick to Dingle takes 7 hours. Alternatively, you can fly. In March in Dingle, expect temperatures between 12°C during the day and 5°C at night. Finish your sightseeing early on the 8th (Wed) so you can travel to Kilkee. Kilkee is a small coastal town in County Clare, Ireland. Relax by the water at Fanore Beach and Lahinch Beach. Get in touch with nature at Cliffs of Moher and Bridges of Ross. Go for a jaunt from Kilkee to Ballyvaughan to see Aillwee Cave about 1:15 hours away. The adventure continues: tour the pleasant surroundings at Flaggy Shore, head off the coast to Scattery Island, contemplate in the serene atmosphere at St Senan's Church, and identify plant and animal life at Doughmore Bay. To find reviews, other places to visit, maps, and tourist information, you can read our Kilkee trip itinerary builder. Getting from Dingle to Kilkee by car takes about 3 hours. In March in Kilkee, expect temperatures between 12°C during the day and 4°C at night. Finish up your sightseeing early on the 10th (Fri) so you can travel back home.